Here’s the thing. There’s a lot about Hopeless I shouldn’t like. Holder was a little too perfect for my tastes, there’s a lot of drama, and the high school is stereotypical. The adults are a little too conveniently absent, there’s a friend you shows up occasionally…basically, a lot of the things that usually turn me completely off a novel are here and yet…I loved it. Hoover wrote everything in such a way that I didn’t care about any of that. I was completely engrossed in the novel and never wanted to put it down. Let’s start with Holder first. I mean…they guy is practically perfect and usually, that bothers me. I like when they screw up and say stupid things and aren’t perfect. Holder knows the right thing to say, the right thing to do even before Sky knows it’s what she needs. I think in any other book, I would have been rolling my eyes and yet I found myself smiling each time he spoke of did something. I think I was okay with it because it wasn’t because he was perfect, but rather because he pretended to be and that confidence made everything work. The storyline is filled with turns and even though I had figured most of it out pretty early on, I still wanted to see how everything played out. I wanted to see Sky face everything and see how she came out on the other side. I was rooting for her the entire time and her strength was amazing. She found that being weak doesn’t mean you aren’t strong…it only means you need a break before turning around and facing everything again. She found her strength in her weakness and I love it. Hopeless is a book that I love more than I should. I love it more than I thought I would. It’s heartbreaking and yet impossibly sweet. 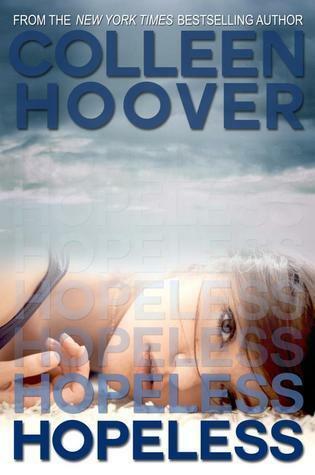 Hoover’s novel sucked me in and I couldn’t put it down. Definitely an amazing read. This entry was posted in Contemporary, The Must Reads and tagged Colleen Hoover, Contemporary, Must-Reads, New Adult.